You may be wondering why we’re asking you to subscribe or renew via our Something Novel Kickstarter page, when you could just as easily hit the subscribe tab above and renew with paypal, or send us a cheque in the mail. And believe us, if that’s how you’d rather subscribe we are more than happy to receive your hard-earned dosh in any form (except cows — we’ll barter for some things, but there’s just no more room for cows). 9. Visibly show your support for the arts. When you become a backer you are not just an anonymous subscriber. 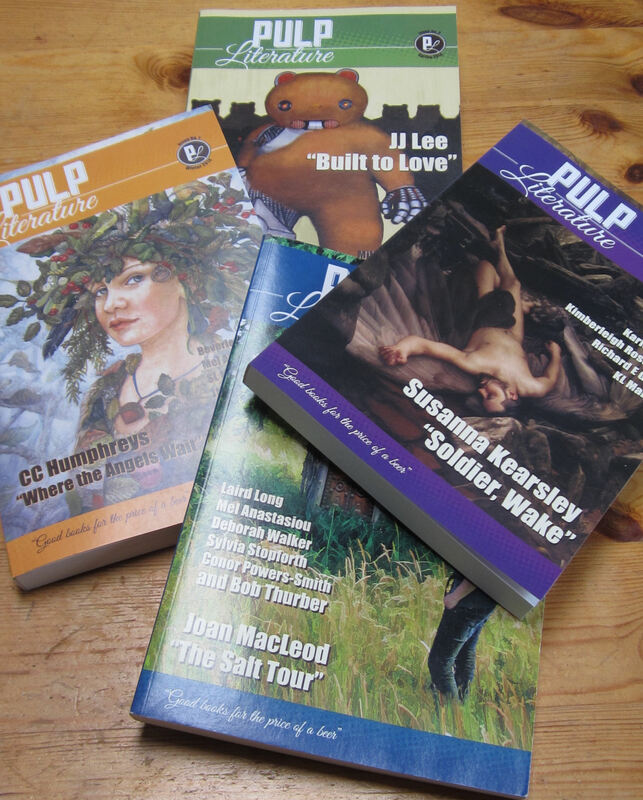 We’ll print all our backer names in issue 14 of Pulp Literature (unless you ask us not to). The campaign page itself remains visible and your name (or pseudonym) will always be attached to it, showing that you care about writing, literature, the arts, and good stories. The backer count itself is as important as the money received in showing the world there is support for grassroots, crowdfunded arts. 8. Gifts for every backer. Every backer receives downloadable files for these beautiful notecards. And for each additional 50 backers who join in, we add another card to the collections. 7. One stop Christmas shopping. No malls, no post office line-ups! We ship our magazines and books anywhere in the world, and for an extra $7 we will hand write and mail a card to the recipient of your choice. You can send multiple gifts on a single pledge by just adding the appropriate amounts. When we send you a survey at the end of the campaign you can let us know the details of all the recipients. 6. A successful campaign generates buzz. The biggest challenge small magazines face is developing name recognition. A Kickstarter campaign gets the word out, spreads our logo and helps people remember the name. 5. Help launch a new Canadian publishing house. Not only can you be among the first to receive Stella Ryman and the Fairmount Manor Mysteries and Allaigna’s Song Overture, you’ll be helping us set foot onto the book publishing stage. The success of these novels opens the door for us to accept new manuscripts for 2017 and 2018. Save $3 your ebook subscription – $15 for a year and $10 for each subsequent year. Those are prices that can’t be beat. A small number of copies of Colouring Paradise our Renaissance-inspired colouring book are on offer for 1/3 off the regular price. Critiques are roughly half off regular rates. Reward bundles like the Reader’s Delight, Writer’s Delight and Collector’s delight offer significant discounts. 4. Inspiration for Writers. The beautiful and helpful Writer’s Boon Companion is only available through the Kickstarter at the moment. Steam-power your writing to the next level! 3. Free ebooks. All our print magazine and novel rewards on the Kickstarter page come with free ebooks or digital subscriptions that you can ask us to give to a friend and spread the joy.